Osmosis is the movement of water or other solvent through a plasma membrane from a region of low solute concentration to a region of high solute concentration. Osmosis is passive transport, meaning it does not require energy to be applied. What causes osmotic pressure is different concentrations of solutes on the two sides of the membrane. When osmosis happens, water moves from the side of the membrane with a lower amount of osmotic pressure to the side of the membrane with the higher amount. 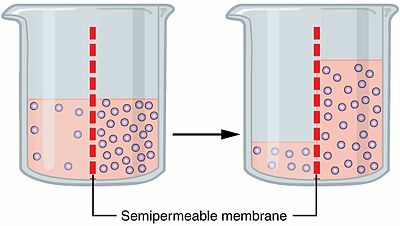 An important example of osmosis is the movement of liquid (solvent) molecules across a cell membrane into a cell with a higher solute concentration. Osmosis is a fundamental part of cell biochemistry, but also has mechanical applications and usages. Solutions may have more or less solute per unit of solvent. The one with less is called Hypotonic. When the two solutions have equal concentration, they are isotonic. The one with more is Hypertonic. When the hypotonic solution is outside the cell,and hypertonic solution inside, the cell becomes swollen and distorted. The plasma membrane of a cell is semi-permeable, which means it allowed the entry of certain molecules in or out, it lets small molecules pass through, but blocks larger molecules,. The membrane also has ports or gateways which get certain macromolecules through. This is active transport, which uses energy and is selective. It is outermost covering of the animal cell. It is made up of proteins and lipids. Example:- Exchange of gases like oxygen and carbon dioxide. This page was last changed on 15 February 2019, at 12:57.